This year will mark the twentieth year of ownership of Mar Lodge Estate by the National Trust for Scotland, and another opportunity to reflect on the progress of management, and consider the next formal review of the Management Plan, due in 2016. NTS is grateful for the support given by NEMT to the Mar Lodge Estate management plan, and noted the comment that "some targets would be useful". The management plan is not the only planning document that helps drive the Mar Lodge work plan. Targets do exist, though are mainly contained within subsidiary plans, such as the management agreement with Scottish Natural Heritage, where they appear as Key Performance Indicators or 'KPIs'. 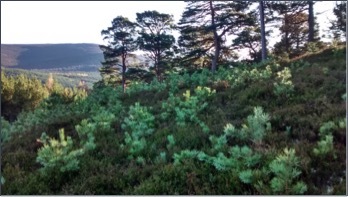 In the case of woodland regeneration, a key management objective for a Nationally important habitat, the kpi is written as "Positive, incremental growth in the average height of seedlings above the height of the dominant ground vegetation, with 75% of seedlings showing positive incremental growth", which is to be achieved by 2016. Progress toward success is reviewed on an annual basis through the Estate's monitoring programme. A brief summary of the 2014 report produced by Shaila Rao (Estate Ecologist) makes encouraging reading. 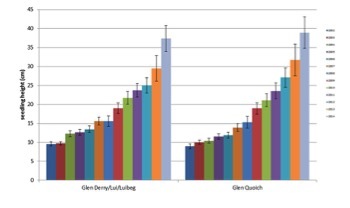 Between 2007 and 2014, average Scots Pine seedling height in Glen Derry /Luibeg increased from 13.4cm to 30.4cm; and in Glen Quoich from 12.2cm to 36.5cm. Overall, over the same period, the percentage of seedlings above surrounding vegetation height increased steadily from 11.2% to 49.1%. The mechanism by which this is achieved, as most people will be aware, is the control of deer density and a consequent reduction of browsing, which, within the SNH kpi, should be at 15% or less in the regeneration zone, when measured from the leading shoots of young trees. (For deer management purposes, the Estate is split into the eastern woodland regeneration zone, and western moorland zone, where a higher density of deer is allowed). In Glen Quoich, this figure was 7.7% in 2013, falling to 2.7% in 2014. Five red deer were recorded in the regeneration zone in March 2014. This equates to a density of less than 1 deer per 100 hectares, which is low enough to allow annual growth of a majority of trees unchecked by browsing. The statistics are impressive, however a brief walk through Glen Quoich or Glen Lui will reward the observer with plenty of visual evidence of young trees now rising through the surrounding vegetation. As part of additional forest management, we have for many years been carrying out restructuring of the inherited plantations of the 1960's and 70's, in order to create a more natural forest structure. Creating gaps in the forest allows the trees left behind to take on a more natural appearance in the landscape than the regimented rows they were planted in, with increased biodiversity. Thinning is carried out using a mixture of horse logging, low impact mechanical harvesting and traditional chainsaw felling, depending on the sensitivity of each site, its location and weather conditions. Timber is the obvious by-product of such thinning, and once sufficient is left in the plantations to provide a valuable deadwood habitat, there is a surplus which may be utilised to fuel the new biomass heating system In November 2014 the boilers for the new scheme were fired up for the first time, providing heat to Mar Lodge itself and the Stag Ballroom, the Stables Block and one staff house. The new shed which houses the system measures 20m x 48m, and was located and constructed following initial consultation with landscape planning staff of the Cairngorms National Park. Two 333kw boilers provide the heat which is carried to the buildings through 600m of insulated piping buried below ground. The size of the shed means there is the capacity to store enough fuel to power the boilers through an entire Cairngorm winter if necessary. In order to power the heating network 1000 tons per year of green round wood is required to be turned into woodchip. The wood is chipped directly into the shed and onto the drying floor where it will be dried to provide the 600 tons of dry wood chip required per year to keep the boilers working. We hope to be self-sufficient in providing wood from within the Estate, however additional timber may be bought in from time to time from neighbouring estates, as in some cases their plantations are closer to the biomass shed, reducing the transport and environmental costs. The financial saving for the Estate on heating costs alone is estimated at £120,000 per year, which will come from the replacement of LPG and oil, and renewable energy incentives from the Government. The further reduction of CO2 emissions of 450 tons per year will make a major contribution to NTS's and national green targets. Elsewhere on the Estate we are continuing with our programme of footpath and track repair and maintenance. We have always been very clear about our rationale behind mountain path management, which is primarily to mitigate against erosion, protect wild land and develop innovative, non-invasive construction techniques whilst providing for access. The Trust's own 'Wild Land Policy' underpins this, and at the same time we remain as close as we can be to the spirit of Percy Unna without, of course, knowing what Unna himself might have made of 21st century developments in landscape, land reform and access. Following significant grant-aided capital repair programmes of the 1990's, we were effectively in a position of a much more cost effective annual programme of maintenance - still difficult to adequately fund, as by definition, maintenance does not qualify for grants. The need for periodic capital repair remains and was recognised, not least if unexpected or unforeseen events should happen. Such an event occurred last August, with the unprecedented flood, in all likelihood the worst recorded since the 'Muckle Spate' of 1829, that severely damaged many kilometres of footpath and tracks. In Glen Quoich, as many will be aware, whole sections of path and track, and a footbridge have disappeared completely. We have surveyed and costed, as far as possible, the full extent of repair required, and will re-commence work this Spring on a priority basis, as funds allow. We are treating the replacement of a footbridge over the Derry Burn as essential work, and hope to have a new bridge, even if a temporary structure, in place by late Spring / early Summer. Important repairs are required in Glen Derry and Glen Quoich, whilst the majority of work needed on higher level routes constitutes drain repairs and resurfacing. With the extensive damage to tracks such as Glen Quoich and Glen Cristie, we are conscious that any remedial work should not equate to hill track development - rather we are looking for consolidation plus some lateral / 'out of the box' thought, whilst maintaining sufficient access for essential deer management. An estimated 34km of footpath and 25km of track suffered "significant" damage or surface loss. 2 footbridges - over the Derry Burn and Quoich river - washed away. 120m of path on the east bank of the Quoich and 100m of path in Glen Lui lost completely. Existing Annual Maintenance commitment: £25,000. Average cost of machine excavator for track repair: £40 per metre. You can follow any updates on access issues affecting Mar Lodge Estate via the dedicated National Park website. You may, if you wish, support path work at Mar Lodge directly through a donation to our Mar Lodge Storm Damage appeal.